Office Space - Linlithgow, West Lothian. A brand new building offers two floors of high specification serviced office space. 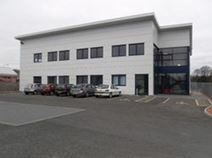 Located in Linlithgow, with good motorway and rail links to Edinburgh, Stirling and Glasgow, the building provides full reception and on-site support teams and extensive parking as well as virtual office packages. All offices are flexible and fully furnished.